The CHATILLON® CDR Series digital scale is an economical weighing solution for general purpose weighing. 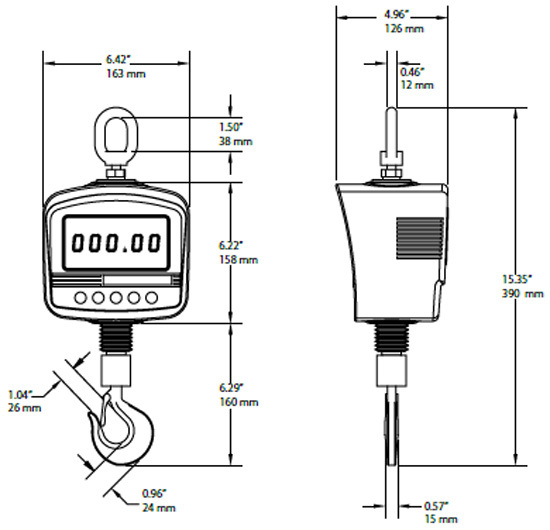 The CDR Series is available in five capacities with a measurement accuracy of better than 0.2% full scale. The CHATILLON® CDR Series digital scale is an economical weighing solution for general purpose weighing. The CDR Series is available in five capacities with a measurement accuracy of better than 0.2% full scale. The scale features an easy-to-read, backlighted LCD display that indicates measured values in either pounds (lbs) or kilograms (kg). The CDR Series is powered using rechargeable battery pack. The scale can display the peak weight. You may add accessories and tare out their weight up to 100% of the scale’s rated capacity. Operation is simple using the integral membrane-style keypad. The standard remote controller allows users to change units, clear measurements, zero and tare out weight and capture peak weight at a distance of up to 100 feet (30m). The remote controller may not be used with the CDR-66-N.